Mahindra’s much awaited powerful Mojo motorcycle is now production ready. Mojo would be Mahindra’s first ever high end motorcycle to feature 300cc engine. 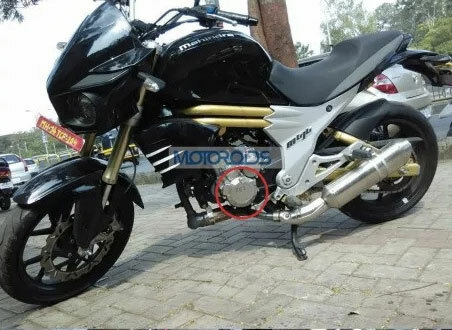 You can see some of the leaked spy shots of Mahindra Mojo captured by MotorBeam. Mojo bike from Mahindra is expected to be released in the month of September. The all New Mahindra Mojo is powered by a 295cc, liquid-cooled, DOHC, 4-stroke, SI engine which is mated to a 6 speed manual gearbox. Mojo’s engine is going to deliver 31.2 BHP of power. Mojo branding sticker can also be found on the tank and engine case. The bike shall get one into two stubby looking exhaust canisters which are placed on either side . As seen before, Mahindra Mojo uses the top spec upside down front forks which is coupled with a rear mono-shock, bolted onto a swingarm that gets a splash of gold on it. For stopping power, the Mahindra Mojo is equipped with a single front and rear disc brake.